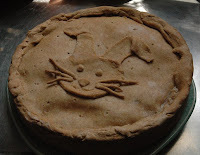 Every Easter, my grandmother would make what we called "pizza gain", a type of southern Italian savory pie. Pizza Gain, know by many other names such as pizza gaina, pizza rustica, Italian Easter pie, is a traditional Italian dish, with ingredients that vary regionally. Unfortunately, pizza gain traditionally contains a lot of meat- ham, prosciutto, salami, capicola, pepperoni, etc. I have decided to make the pie this year, substituting meatless products in our family recipe. combine dry ingredients first and then add moist ingredients. Combine in food processor until it forms a ball. chill for 1 hour. roll out to make dough. line pans with dough. My dad uses round spring form pans, my grandmother used rectangular loaf pans. I favor the loaf pans, but it's your choice. meat substitute- I used 1 package veggie pepperoni and 1 package veggie ham slices cubed. enough eggs to bind ingredients (4-6 eggs?) so the mixture is firm, but not dry. Mix all ingredients and fill dough-lined pan. Cover with top layer of dough. Bake 1 hour in oven at 350 degrees. Remove from oven and cool. Refrigerate. This is best served at room temperature. *Basket Cheese is a traditional cheese that can be found in delis around Easter. It is also know as Farmers Cheese or Easter cheese. It is the consistency of Tofu, which can be used instead. I ended up making two pies. I ran out of filling for the second one, so I added tofu. Both are delicious. My husband and I enjoyed this with hot sauce, but you could also add red pepper flakes to the cheese mixture for spice. A slice of the pizza gain loaf.